The day when the 5th walkathon was held, there was not a cloud in the blue sky. Like the fresh green leaves of trees whose sap began to rise, children walked with bright smiles on their faces, holding their parents’ hands on Mount Namsan in Seoul. The New Life Welfare Foundation had held the New Life Family Walkathon every year together with the Save the Children Korea from the year 2002, and this year it was the 5th walkathon. This year, under the slogan, “Children First,” they declared to the world that all children have rights to be protected first—in the areas of food, clothes and housing, medical treatment, education and environment. 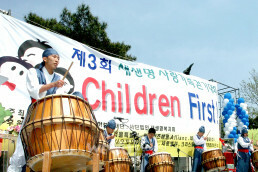 At 11 a.m. on April 25 (Sunday), 2004, the walkathon began with the starting announcement of the New Life Welfare Foundation Chairwoman Zahng Gil-jah. At the head of the procession, there were the New Life Welfare Foundation Chairwoman Zahng Gil-jah, Save the Children Korea President Lee Bae-geun, Commission on Youth Protection Chairwoman Im Seon-hee, Actress Kim Chang-suk the Sponsor Chairwoman of Save the Children Korea. 6,500 participants walked along the Namsan northern ring road from the entrance of the National Theater of Korea to the Baek-bum Plaza. It was sunny with cool winds. 6,500 members were happy with their families as if they had a picnic. Various events were prepared along the walkathon path—walking barefoot, blowing up a balloon and popping, striking a bell, and thumb marking, through which the participants could strengthen their family unity and looked around their unfortunate neighbors. Just as the Chairwoman said, “We are living in the age of materialism and people are getting hardhearted. However, the world will change by our small effort if we first take care of our neighbors in need and help children,” members took meaningful steps forward to deliver new life and love to the world. After finishing the walking, the members had lunch with their families at the Baek-bum Plaza. In several places around the plaza, free beverages and face painting were provided for children. Traditional Korean games were also prepared: tuho, playing shuttlecock with the feet, playing an elastic thread and so on. After lunch, the celebration performances started from 1:30 p.m. First, the children with heart disease both domestic and overseas, who were being supported by the foundation, were introduced; Cho Gyeong-hwa who is Korean, and Hoang Thi Phuong Ahn (7) and Nguyen Trung Duc (14) who entered Korea from Vietnam for their operation. The members gave them a big hand, wishing them health. After the Chairwoman’s speech, exciting performances were presented by various groups of children and youth: New Life Children Choir, Youth Nanta, Children Song Dream, Vimu Art. They danced, performed a musical, played instruments and sang children’s songs. Among them, the children’s musical, “The Rabbit and the Tortoise,” performed by the New Life Children Choir received a big round of applause for their cute make-up and good acting. Finishing all the programs, the members cleaned their seats and went back home one by one. People who loved their family and neighbors were truly more beautiful than flowers. As long as there are opportunities to practice love for our unprivileged neighbors, the New Life Welfare Foundation members will continue to walk for them.